So good to be able to observe Nature closer than usually! J’étais justement entrain de me dire qu’il fallait que je m’entoure de plantes! très belle photo! Is there anything more classically designed than those wonderful, small, hex shaped black and white tiles? I remember them from my grandparent’s bathroom, my bathroom growing up and now have them in my own bathroom. And yes, I often have fresh plants/flowers in my bathroom. Ça se fume ça aussi ? 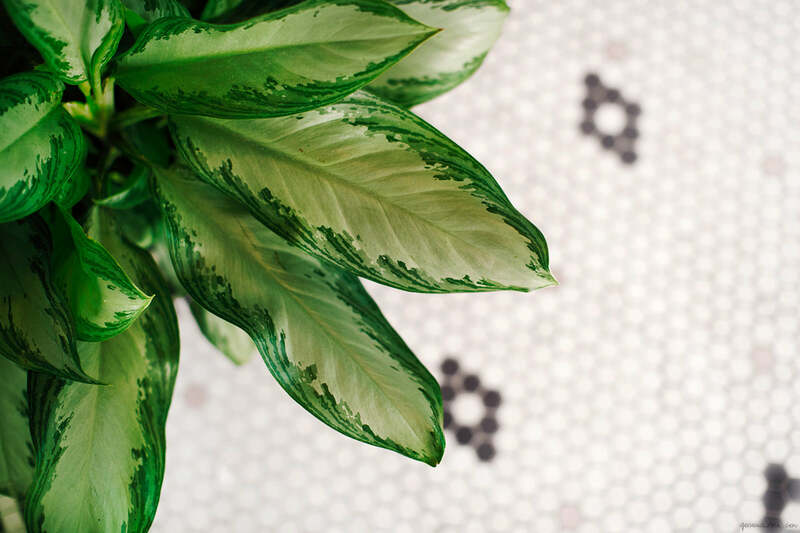 Great shot—your focus on the details of the color banded striped leaves juxtaposed against the hard, cold surface of diagonol black & white tiles is just fantastic! What an eye you have! As a designer I see things, including living, like this!! !